Pariyatti exists to bring people into contact with the teachings of the Buddha. We provide resources in the Theravāda tradition, and support Pāli language students and Vipassana meditators, in the tradition of Sayagyi U Ba Khin as taught by S.N. Goenka. We serve meditators, scholars, educators and the public by providing ready access to hard-to-find titles, a large collection of online resources, pilgrimages, and Pāli workshops. Our staff come from different backgrounds, telecommute from various locations, and have varying levels of competence and responsibility. What we have in common is our interest in growing in and serving Dhamma, and working with fellow colleagues on this Path. We continue to learn how to improve our operations in order to make them more efficient, and to develop ways to serve our supporters with beneficial resources. We aim to fairly compensate staff based on their level of responsibly and experience, as well as the prevailing wages for similar work where they are based. We offer unpaid time off for vacation or to sit and serve Vipassana meditation courses. Our goal is to schedule our time off, so that every employee has the opportunity to sit at least one long course; that is, a 20, 30, 45, or 60-day course every year, and to serve at least two 10-day courses every year. Our facility in Onalaska, provides staff with private offices, a shared meeting space, a shared kitchen, ping pong table, and a meditation hall. Being able to communicate well in English, both written and spoken, is a must. As is a willingness to work hard, and to be open to learning new things. You may request additional financial information from the Executive Director. The 990's available below are abridged. 2016 - Form 990 Note: This is for a short tax year of January 1 to June 30, 2016 since we transitioned to a fiscal year ending June 30th. In the winter of 1985-86, a Vipassana student accepted a small loan from fellow meditators in order to start a project of making books and tapes available by mail order to other Vipassana meditators. She was following S.N. Goenka’s advice, that no meditation center should sell these materials directly, and that some student(s) should be found to do so separately; and as a service to Vipassana students as a whole. Goenkaji specified that they could set reasonable prices, and make a profit for this service. So the business model was originally defined by this guideline. The subject of a name for her fledgling business naturally came up. The idea arose to call it Pariyatti Book Service, and it seemed to stick. This choice was especially appreciated, since it contained the word "service". Even though it was to be operated like any small business; it was understood from the beginning, that it would not make much money. It was a chance to provide service while making a small living. Another aspect of the name was appreciated; that the word "pariyatti," meaning theoretical teachings of the Buddha, was a Pāli word. It also tied the name to the Theravāda tradition, and it was the correlate of the word "paṭipatti," meaning to practice. The Pariyatti we have today was created by the merger of the Pariyatti Book Service, (see above), and Vipassana Research Publications of America, (VRPA). VRPA started operations in January 1996, (see here), and merged with Pariyatti Book Service, later that year. In the following years, Pariyatti took on North American distribution of books produced by the Buddhist Publication Society of Sri Lanka, and the Pali Text Society of the UK. In the early 2000's, Pariyatti maintained a full staff with offices in Seattle. During this period, it never turned a profit, and was sustained by generous contributions from a founding supporter. 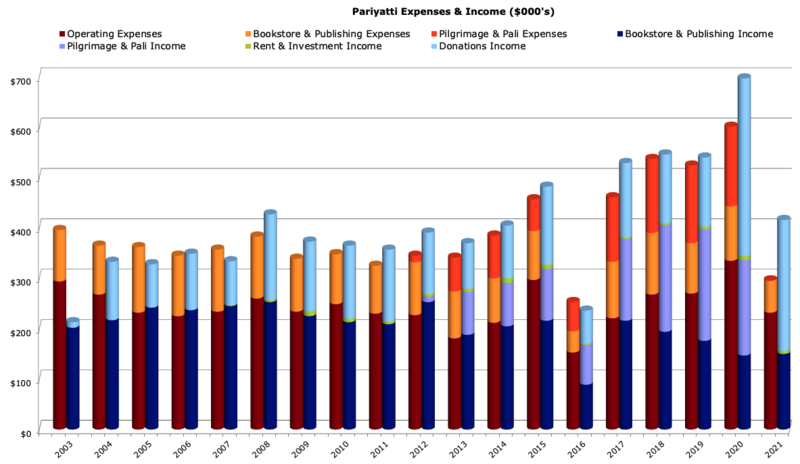 After the dot-com bust, funds were not as easily available; and Pariyatti started the process of becoming a registered non-profit organization. In 2002, Pariyatti received recognition from the US IRS, as a 501(c)(3) Charitable Non Profit Organization. During its early years as a non-profit, Pariyatti tried to maintain a full staff; but ran into significant losses annually, (more info here). This was a period in Pariyatti's history, when even the needs of payroll were difficult to meet. In subsequent years, staffing levels at Pariyatti were significantly reduced; and now, a very small staff is able to run operations. Pariyatti has a small hard-working team that leverages technology, and the support of many volunteers. In recent years, in addition to maintaining the Bookstore and growing its Publishing program; Pariyatti has launched Pilgrimages and Pāli Workshops. There remains much work to be done; worldwide interest in the teachings of the Buddha, continue to grow.